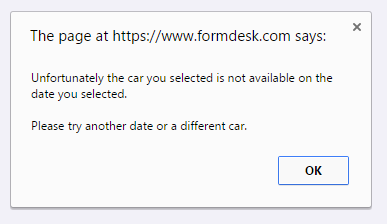 Formdesk has a separate option for checking duplicate entries. You can indicate whether a certain answer or combination of answers has to be unique or can only occur a specified number of times in the database of entries. You can also set which message should pop up when these conditions aren’t met. This feature is very useful for reservation forms or for checking the availability of a certain workshop. But it can also be used for an application form for a newsletter in order to verify whether the email address entered has been submitted before. 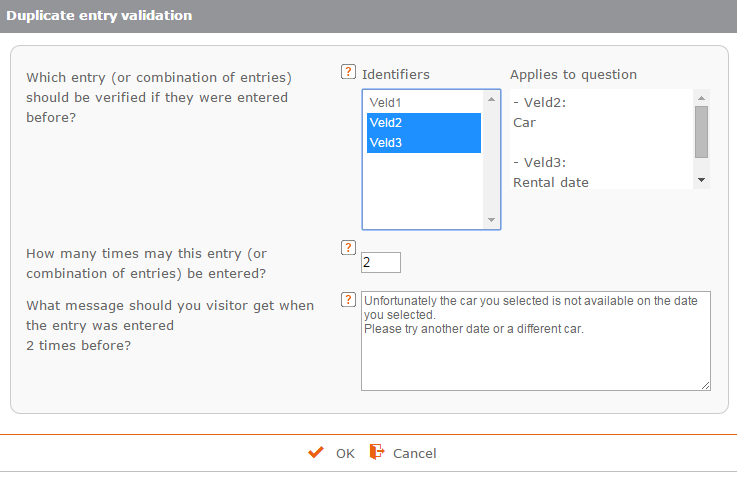 A limitation of this validation method is that you can only define one set of terms for every form. This means, for example, you can only validate a workshop’s availability for a single workshop. These types of validations can, however, also be performed in another, more flexible way. You can use the lookup feature to count how many times a specific answer has been given and the enhanced validations feature to ensure this number is within the accepted range.